MADRID - Madrid's regional government says it's going to kill the pet dog of a Spanish woman who became infected with Ebola. Authorities said in a statement Tuesday that available scientific knowledge indicates there's a risk the dog could transmit the deadly virus to humans. The Spanish nursing assistant became the first case of Ebola being transmitted outside of West Africa after she cared for a Spanish priest in Madrid who died of Ebola last month. She and her husband are now in quarantine. The government said the dog, named Excalibur, would be euthanized in a way to avoid suffering and using bio-security measures that it did not specify. Its body will later be incinerated. The government had to get a court order for the euthanization over the family's objections. In other news, three more people were under quarantine Tuesday for possible Ebola at a Madrid hospital after a Spanish nursing assistant became infected there, authorities said. More than 50 others were being monitored as experts pressed to figure out why Spain's anti-infection practices failed. Health authorities were investigating how the nursing assistant, part of a special team that cared for a Spanish priest who died of Ebola last month, became infected. She was the first case of Ebola being transmitted outside of West Africa, where a months-long outbreak has killed at least 3,500 people and sparked social unrest. Her case highlighted the dangers health care workers face while caring for Ebola patients - more than 370 health care workers in the hardest-hit countries of Liberia, Guinea and Sierra Leone have died. Dr. William Schaffner, an infectious disease expert at Vanderbilt University, said her case shows that health workers can be at risk not only in West Africa but in the sophisticated medical centers in Europe and the United States. The virus that causes Ebola spreads through direct contact with the bodily fluids of an infected person. Officials said the Spanish nursing assistant had changed a diaper for the priest and collected material from his room after he died. Dead Ebola victims are highly infectious and in West Africa their bodies are collected by workers in hazmat outfits. Meanwhile, a Norwegian doctor infected with Ebola while working in Sierra Leone arrived back in Norway on Tuesday for treatment. Officials gave no details about her condition but said she was in an isolation ward at Oslo University Hospital. News of the Ebola quarantines spooked investors Tuesday because Spain is one of Europe's biggest tourist destinations. Shares of Spanish airline and hotel chain companies slumped as investors feared the Ebola case might scare away travelers. The nursing assistant, reportedly in her 40s, was not identified to protect her privacy but union officials she had 14 years of experience and authorities said she had no children. Jose Ramon Arribas, the chief of the Carlos III hospital's infectious disease department where she was under quarantine, said she was being treated with blood plasma from an unidentified cured Ebola victim. The hospital also had an experimental anti-viral drug called Favioiravir available if needed, he said. The nursing assistant's husband has shown no signs of having the disease but was hospitalized as a precaution, said Dr. Francisco Arnalich, head of internal medicine at the Carlos III hospital. Health authorities identified her as a nurse Monday night but said Tuesday she was a nursing assistant. A nurse who also treated the priest who died Sept. 25 was put into quarantine after experiencing diarrhea but she did not have a fever. And a Spanish engineer who arrived home after traveling to Nigeria was also under quarantine but his first test was negative for Ebola. Public Health Director Mercedes Vinuesa told Parliament authorities were drawing up a list of people who may have had contact with the nursing assistant with Ebola. 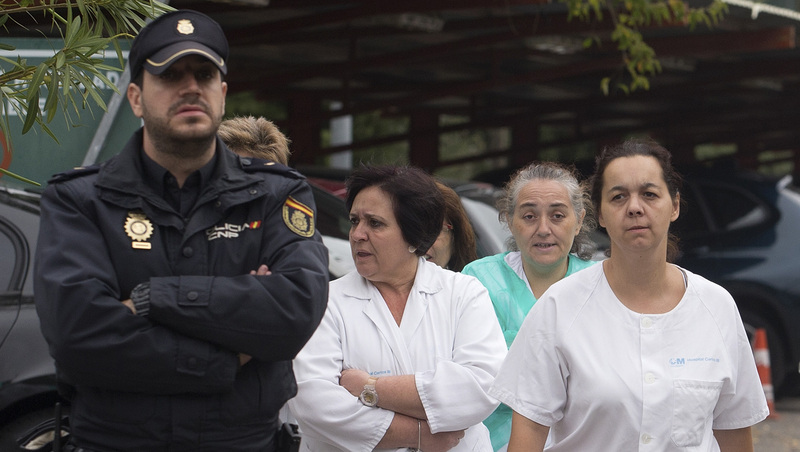 By Tuesday, they had gotten in touch with 22 people - including relatives and personnel at the hospital in the Madrid suburb of Alcorcon where the nursing assistant went Monday with a fever. They were also monitoring 30 other members of the health care team that treated Manuel Garcia Viejo, the priest who returned from Sierra Leone and died from Ebola. The Health Ministry's chief coordinator for emergencies, Fernando Simon, told Cadena SER radio the nursing assistant with Ebola was in stable condition and her life was not in immediate danger. Health officials said she had no symptoms besides fever. Simon described her hospitalized husband as "OK and relatively calm." He rejected criticism that authorities were slow to react to the case, but about 20 health care workers at the hospital protested outside Tuesday. They called for the resignation of Health Minister Ana Mato amid claims by union officials that Spanish health workers have not received adequate anti-infection training or the most modern Ebola protection equipment. Rafael Perez-Santamarina, the hospital's director, said authorities did not know yet how the nursing assistant got infected despite the use of internationally recognized precautions against Ebola. "When we finish the investigation, we will be able to say," he said. The nursing assistant also helped to treat 75-year-old Spanish priest Miguel Pajares, who got Ebola in Liberia, flew back to Spain, received the experimental Ebola medicine ZMapp but still died in August. The other Spanish Ebola patient, Garcia Viejo, who was in charge of the San Juan del Dios hospital in Lunsar, Sierra Leone, was not given ZMapp because worldwide supplies ran out. The nursing assistant went on vacation after Garcia Viejo died but health officials said she did not leave the Madrid area. In the U.S., video journalist Ashoka Mukpo, who became infected while working in Liberia, arrived at the Nebraska Medical Center in Omaha. It's not clear how he was infected, according to his father. Mukpo is the fifth American sick with Ebola brought back from West Africa for medical care. The others were aid workers - three have recovered and one remains hospitalized. There are no approved drugs for Ebola, so doctors have tried experimental treatments in some cases. A critically ill Liberian man hospitalized in Dallas with Ebola is getting an experimental treatment, Texas Health Presbyterian Hospital said. Thomas Eric Duncan is the first person to be diagnosed with Ebola in the U.S. He is receiving an experimental medication called brincidofovir, which was developed to treat other types of viruses. Laboratory tests suggested it may also work against Ebola. Texas Gov. Rick Perry, meanwhile, urged the U.S. government to begin screening air passengers arriving from Ebola-affected nations, including taking their temperatures. But federal U.S. health officials say a travel ban could make the desperate situation worse in those countries. White House spokesman Josh Earnest said it was not currently under consideration. President Barack Obama said the U.S. will be "working on protocols to do additional passenger screening both at the source and here in the United States." He did not elaborate.